20 inch underarm – 4 ozs. Length from top of shoulder – 16½ ins. Length of sleeve from under-arm – 2 ins. A Small Quantity of Pearsall’s Filoselle Silk for Embroidery. To get these measurements it is absolutely necessary to work at a tension to produce 8 stitches to the inch in width on larger needles. Using larger needles, cast on 147 stitches. ** 1st row: K1, * K1, yo, K5, yo, rep. from * to last 2 sts., K2. 2nd row: K1, * P1, K1, P5, K1, rep. from * to last 2 sts., P1, K1. 3rd row: K1, * K1, P1, yo, K5, yo, P1, rep. from * to last 2 sts., K2. Rep. from ** to ** twenty-four times. 1st row: K4, * K2tog, rep. from * to last 5 sts., K5 (78 sts.). 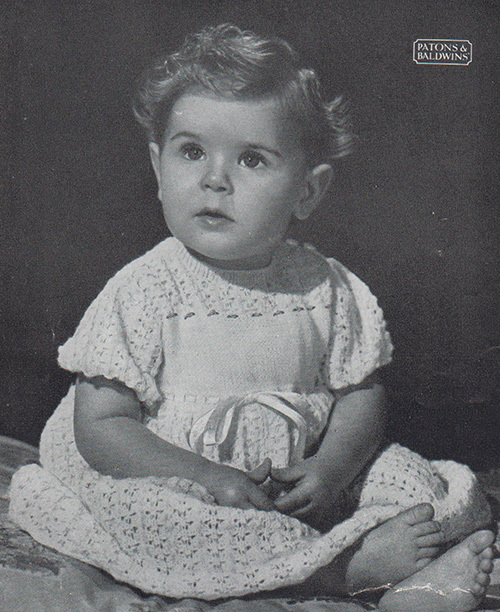 2nd, 4th and 6th rows: Knit plain. 3rd row: K2, * P1, K1, rep. from * to end of row. 5th row: K2, * yo, K2tog, K1, rep. from * to last st., yo, K1. 7th row: K2, * P1, K1, rep. from * to last st., K1 (79 sts.). 2nd row: K1, purl to last st., K1. Rep. 1st and 2nd rows three times. Continue in plain smooth fabric, casting off 3 sts. at beg. of next 2 rows; then 2 sts. at beg. of following 2 rows, then dec. once at beg. of every row eight times. Work 4 rows without shaping. Rep. from ** to ** twice. 1st row: K1, (K1, yo, K5, yo) three times, K1, yo, K3, cast off 17 sts., K3, yo, (K1, yo, K5, yo) three times, K2. 2nd row: (K1, P1, K1, P5) three times, K1, P1, K1, P2, K1. 3rd row: Cast off 3 sts., (K1, P1, yo, K5, yo, P1) three times, K2. 4th row: K1, (P1, K2, P5 tog, K2) three times, P1, K1. 5th row: K2tog, (yo, K5, yo, K1) three times, K1. 6th row: (K1, P1, K1, P5) three times, K2. 7th row: K2tog, (yo, K5, yo, P1, K1, P1) three times, K1. 8th row: K1, (P1, K2, P5 tog, K2) three times. 10th row: Work to end of row. Cast off. Join in wool at neck edge and work on remaining sts. to correspond with other side. Work as given for Front to ***. Using larger needles, rep. from ** to ** twice. 1st row: Cast off 4 sts., K2, * K1, yo, K5, yo, rep. from * to last 2 sts., K2. 2nd row: Cast off 4 sts., P3, * K1, P1, K1, P5, rep. from * to last 5 sts., (K1, P1) twice, K1. 3rd row: Cast off 2 sts., * K1, P1, yo, K5, yo, P1, rep. from * to last 6 sts., K1, P1, yo, K4. 4th row: Cast off 2 sts., P3 tog, K2, * P1, K2, P5 tog, K2, rep. from * to last 2 sts., K2tog. Keeping continuity of patt., dec. once at beg. of every row eight times. Continue in patt. without shaping until armholes measures same as Front armholes. 1st and 2nd rows: Work to last 10 sts., turn. 3rd row: Work to end of row. Cast off. Using smaller needles, cast on 42 stitches. Rep. 1st row five times. 7th row: K8, * inc. once in next st., rep. from * to last 7 sts., K7, (69 sts.). Using larger needles, rep. from ** to ** four times. Keeping continuity of pattern dec. once at each end of every row, until 21 sts. remain. Cast off. Using a flat seam, sew up right shoulder seam. With right side of work facing and using smaller needles, knit up 84 sts. evenly round neck. Rep. 1st row three times. Cast off in rib. Using a flat seam, sew up left shoulder for ¼ of an inch. Sew up side and sleeve seams. Sew in sleeves placing seam to seam. Using Crochet Hook work 2 rows of d.c. (US single crochet) round shoulder opening, making 3 buttonhole loops on front side in 2nd row. Work one row of d.c. round lower edge of frock. Work grub roses on bodice as illustrated. Thread ribbon through holes at waist. Finally press all seams. The original publication of this pattern is in the public domain, however this version with additional information and updated terms is copyright Sarah Bradberry, May 16th 2014. All rights reserved.